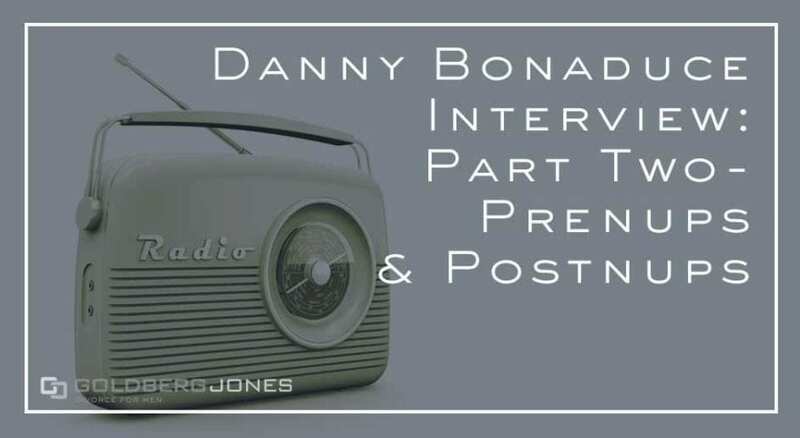 One the first Wednesday of each month, Rick Jones, one of our founding partners, stops by The Danny Bonaduce & Sarah Morning Show to take questions from callers on all aspects of family law. Normally Rick and Danny take questions from callers, but we thought it would be fun to switch things up. We turned the tables on Danny and asked him about his own extensive history with family law. Danny: “I saw him two times on the radio do this: [Danny attempts to sound like Rick] ‘You know it’s so weird, I’m pretty sure I don’t have an answer for you on that,’ and I’ve gone to move on–he’s my friend, it’s good radio, I’ll move on–and then he goes, ‘But let me say this…’ and then answers the question for the next six minutes, which was exactly the answer they were looking for and/or needed. “This is not from a friend, a client, or anything else, it’s just my factual experience with Rick Jones because he almost always–and I say ‘almost’ just so I don’t sound crazy–but he almost always has the answer. Danny: “Yeah, I really did. I didn’t have a prenup [in previous marriage], but I didn’t really have anything for the last wife, I got it all during the marriage. But I didn’t get one and that mistake cost me at least one of the $3,000,000 it cost me. “I didn’t want to do it, Amy and I were having a lovely time. But I had said so many times, ‘You‘re a fool, if you’re the one with the money, get a prenup, that’s silly [not to get one].’ And if somebody says, “I think it ruins all the things about marriage,’ they’re lying in my opinion, they do care, they care a lot about the money.